When getting help to people living on the streets poses a challenge, put the help on wheels. That’s the solution offered by a new mobile mental health and addictions treatment initiative, which hit the road for the first time Thursday evening to connect Windsor’s most vulnerable with community supports. The public at large should expect this kind of thing from their healthcare system. Born from a unique collaboration between four local community agencies, the Mobile Outreach and Support Team pilot project will see a support worker, an outreach worker, and a driver trained to assist people with physical disabilities travel around the city’s downtown and west side to link individuals living on the streets with short and long-term care. Over the next five months, the team of three will move between designated stops Monday through Friday from 5 p.m. to 9 p.m., a time when a gap in mental health services exists, said Hotel Dieu Grace Healthcare CEO Janice Kaffer. On Mondays, Wednesday, and Fridays, the team will visit two of three downtown locations Kaffer said outreach workers identified as places vulnerable people frequent: the Windsor Public Library’s downtown branch, Wheelton Manor on Glengarry Avenue, and the Downtown Windsor Business Accelerator on Ouellette Avenue. On Tuesdays and Thursdays, the team will visit two of four places further west: the corner of University Avenue West and Bruce Avenue, the underpass at University Avenue West and Caron Avenue, the Ontario Addiction Treatment Centre, and Adie Knox Herman Arena. Individuals wondering where the van is can call or text a cell phone number operated by one of the team members during hours of operation, Kaffer said, so they know where to go on any given night. 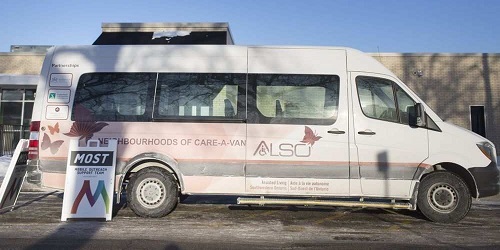 But the van will not deviate from its planned stop to come to callers, she added.Family Services Windsor-Essex, Assisted Living Southwestern Ontario, the Canadian Mental Health Association’s local branch, and Hotel Dieu Grace Healthcare have been planning the Mobile Outreach Support Team together for over six months, Kaffer said. The “innovative and creative” project was possible because the participating agencies checked their egos at the door and worked for the good of the community, rather than to help their public images, she said, adding she believed these collaborations would occur more frequently in the future. Supplies that will be provided to those in need are stocked in the Mobile Outreach Support Team (MOST) van. “The public at large should expect this kind of thing from their healthcare system,” Kaffer said. 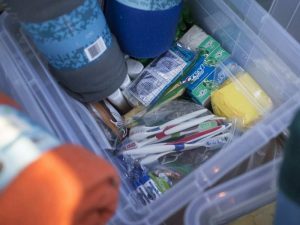 “It really is about making sure we’re having an impact.” Inside the 26-foot fully accessible van, the team had storage bins containing day-to-day necessities—toothbrushes, lip balm, deodorant, soap, and more—as well as snacks, water bottles, blankets, and other cold weather supplies. Also onboard were Naloxone kits and the basics of a needle exchange program, though Kaffer emphasized the van was not a safe injection site. In addition to handing out needed items, the team will provide individuals with information about community services available to them outside the van, Kaffer said. “Many folks living in public spaces have had difficulty accessing the services they need in the past,” Kaffer said, citing barriers to access including people not knowing what services are available, not knowing where to go to access services, and not being well enough to realize they may be assisted by local agencies. Kaffer said she hoped the mobile team could help individuals establish a trusting relationship with community agencies, so they would ultimately feel comfortable visiting Hotel Dieu Grace Healthcare’s Transitional Stability Centre on Ouellette Avenue, which provides mental health and addictions treatments. If the final evaluation deems the Mobile Outreach and Support Team pilot project a success, the founding organizations will seek funding to continue and expand it from the province, Kaffer said. If the project doesn’t work, the collaborators will try something else.